With America's entrance into the Second World War, the town of Blackberry Springs, Alabama, has exploded virtually overnight. Workers from all over are coming south for jobs in Uncle Sam's munitions plants--and they're bringing their pasts with them, right into Dolly Chandler's grand but fading family home turned boardinghouse. An estranged young couple from the Midwest, unemployed professors from Chicago, a widower from Mississippi, a shattered young veteran struggling to heal from the war--they're all hoping Dolly's house will help them find their way back to the lives they left behind. But the house has a past of its own. When tragedy strikes, Dolly's only hope will be the circle of friends under her roof and their ability to discover the truth about what happened to a young bride who lived there a century before. 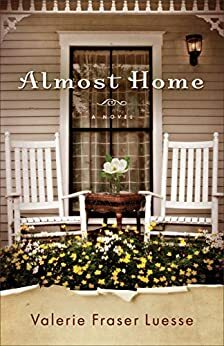 Almost Home was jam packed with love stories, a great mystery (hidden treasure), PTSD, grief, some great action, and trust in a loving God who helped them along the way. Listen, there was a lot of heart breaking grief that flowed through these pages but there were also some happy and wonderful moments entwined in their lives. The first feeling that this book might be a little different was a shocker. It had me laughing and it woke me right up. I couldn't wait to read more to see what was in store. There are so many great love stories included in Almost Home. Of course, I wanted details about each one and thankfully was not disappointed. I especially loved to hear about Si and Dolly. As a older couple with they gave gentle tidbits of wisdom and guidance to the younger ones. They remained my favorite characters throughout the book. A wonderful, wonderful read that's a keeper! This book was given to me by Revell and I gave my honest opinion.